Baby raccoons may be cute, but they shouldn’t be allowed to take over your property. Raccoons will bite if cornered or provoked, and they carry many dangerous diseases such as rabies. 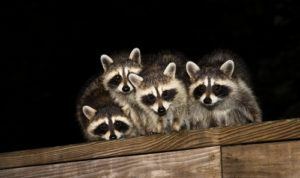 It’s unsafe to remove baby raccoons from a yard, attic, or basement, yourself; call Critter Control® for professional animal removal services in Ft. Worth. A mother raccoon will normally have about five kits who depend on her for food and shelter. Mothers often take their kits to shelter in chimneys, crawl spaces, attics, or basements, leading to conflict with humans. Baby raccoons can stay with their mothers up to a year, so an infestation can persist for months if not handled right away. Newborn raccoons look similar to adults, with the same ringed tails and black or brown mask-like markings around their eyes and cheeks. It takes about three weeks for baby raccoons to open their eyes and longer for them to be able to run and forage on their own. Never try to force raccoons (particularly babies) off your property. A mother raccoon is likely helping her babies forage and store fat for fall and winter. If she thinks you are threatening her kits, she will bite or scratch. Kits will do the same thing if handled. Critter Control® can safely remove raccoons from your property. We use humane methods to discourage them from returning and will teach you how to protect your property. Call or fill out a Contact Us form today.